Despite its commitment to provide 100 days employment guarantee to all the eligible rural youths in the National Minimum Programme, and strong recommendations from Sonia Gandhi-headed National Advisory Council, the government is likely to delay and dilute the provisions of the Employment Guarantee Programme. Despite the biodiesel plant (Jatropha) hype created by the state governments and notwithstanding the hard selling of such projects in Punjab and Haryana, farmers are wary of diversifying. To take on vehicles like Qualis, Sonalika International Ltd, which till now manufactures tractors, is set to roll out its 1900 cc car ‘Rhino’ on the Indian roads by March 2005. The government is considering scrapping the policy of fixing petrol and diesel prices every fortnight and may instead opt for revising the rates every quarter or even half yearly so as to avoid frequent price changes. Trade unions in the oil public sector undertakings today threatened to go on a nationwide strike demanding regularisation of more than 1,00,000 contract and contingent workers in the sector. Russian Federation President Vladimir V. Putin today visited the corporate headquarters of Infosys Technologies Limited and the Bangalore complex of Hindustan Aeronautics Limited here. Airtel is all set to make the dream of watching a film on the mobile handset become a reality for the first time in the world with the premiere of Arindham Chaudhari’s, Rok Sako To Rok Lo, for its customers on December 9 at 3 pm. This is a day prior to the actual release of the film in the theatres. Q. I have an ancestral agricultural land situated nearly 1,000 feet or so outside the Ludhiana City Municipal Corporation limits. It is being used for agricultural purposes since 1947 as per revenue records. On the back of strong FII inflows and sliding oil prices, the markets rallied last week but the momentum weakened towards the weekend on the back of profit booking. The buying was seen across-the-board and the Sensex gained 287 points for the week to close at 6,323. After refusal of state governments to share the cost of implementation, estimated to be around Rs 40,000 crore annually, the government is re-thinking to implement the Act during the current fiscal. In fact, Mr Raghuvansh Prasad, Union Rural Development Minister, has told the Lok Sabha that though Employment Guarantee Bill could be introduced in the current session, the government would like to refer it to the Standing Committee so that all the aspects of the Act could be discussed with the state governments. Further, Mr Prasad said the government would merge newly introduced Food-for-Work programme in the most backward 150 districts of the country with Employment Guarantee Programme. Other ongoing rural schemes are also likely to be merged in this Act. The government also clarified that the new Act would not ensure payment of uniform wages to the labourers throughout the country. Rather, the state governments will be free to pay their own minimum wages under the programme ranging from Rs 40 in north-eastern states to over Rs 100 in Kerala. The insiders said since it would not be easy for the state governments to revise upward their minimum wages due to strong opposition from Industrialists and landlord lobbies, the rural unemployed youth would not be able to get same level of wages. Responding to the former Chief Minister of Chattisgarh, Ajit Jogi’s suggestion that the government should also study the Maharashtra Employment Guarantee Scheme, Rural Development Minister said,” we will ensure that all significant points of the Maharashtra Act and problems faced there would be taken into consideration while implementing that Act”. There is tremendous potential for trade between The Netherlands and India. “The Netherlands being the eighth largest trading nation in the world is a home to many multinational corporations and provides excellent opportunity for business in many areas that could be of mutual interest between the two countries” This was stated here today by Mr Eric F. Ch. Niehe, High Commissioner of The Netherlands while delivering his address at a special session ‘Doing Business with The Netherlands’ organised by the Confederation of Indian Industries (CII), as part of Agro Tech 2004. He added that the Netherlands had a very large investment from the US companies that realised the trade potential of his country and India too can work on several areas of mutual interest, especially in the field of agri-business. The rewards would be mutually beneficial, he said adding that the world today realises the potential of India in promoting trade across the globe. Talking about the immense potential, Mr. Arnold Parzer, Counsellor for Agriculture, Nature and Food Quality, the Netherlands said: “At present, the trade with India constitutes less than 1 per cent of the total trade of The Netherlands. There is a tremendous potential in the agri-business sector itself as around 3 per cent of the population (around 85,000 persons) is involved in agriculture in the Netherlands. The strong points of the agricultural sector are the Dutch Auction system, formation of virtual IT market for fruits and vegetables by farmers, chain management and independent certifying agencies like SKAL and Foodcert. There is high emphasis on quality,” he said. Speaking about his experience in Indo-Dutch ventures, Mr Manish Jain, Managing Director of KF Bioplant, said, “It is very easy to approach a credit rating company in the Netherlands. There is insurance for perishables, royalty administration, recognised mediators and grants and subsidies. However, it is very essential to know the real market conditions in each sector,” he warned. Mr. Hemendra Mathur, Associate, Rabobank, while talking about the future possibilities of Indo-Dutch partnerships in the food and agri-business said the focus should be on increasing the food and agriculture business and opportunities across the agriculture supply chain. Agro Tech 2004, India’s premier biennial agro technology fair will end tomorrow. A cross-section of farmers, seed suppliers and government officials, who interacted with TNS at the ongoing Agro-Tech Fair today, said much needs to be done to propagate this crop as a source of income. “The variety provided by the government is vulnerable to foggy condition. Further, nothing is being done to create a marketing strategy for the produce. A farmer, who dares to diversify, has to do it all by himself sans government support,” says Raj Sher Singh Chinna, a Jatropha farmer from Hoshiarpur who suffered losses due to foggy conditions. He adds that the ‘Manipur variety’ may be more suitable for this region. An official from the Department of Horticulture, Haryana, says that though the state government provides 25 per cent subsidy per acre of Jatropha plantation yet the response has not been encouraging. “Only those farmers, who have wastelands at their disposal, are coming forward simply because they have nothing to lose,” he adds. Economics of Jatropha plantation states that while the establishment and maintenance cost of the crop is Rs 25,000 per acre, it may yield 25 to 30 quintals of seed per acre, which produce 45 per cent oil on seed weight basis. Government statistics says if 10 million hectares of India’s wastelands are used for biodiesel production, with a modest estimate of 1.5 tons of seeds per hectare, 4 million tons of biodiesel would be produced, which is one tenth of the country’s annual oil requirement. Dr D.K. Bhatnagar, a professor from HAU, says that enquiries about setting up Jatropha plantations have been very less, mainly because any farmer who diversifies studies the marketing pattern first. “Since the whole concept is new, a well-laid out marketing system is missing,” rues another official. Mr S.S. Shekhawat from Department of Agriculture, Rajasthan, says despite National Oilseeds and Vegetable Oil Development Board and Central government providing a grant of Rs 7,500 per hectare, state agencies are cautious about promoting Jatropha. “The main reason is no one currently knows how lucrative a project could be financially,” he says but adds that queries have poured in more out of curiosity. An official of Punjab Agro attributes this phenomenon to lack of publicity on the part of state governments. Sanjeev, a seed dealer, says that most of those who enquired about Jatropha seedlings had a pragmatic approach as they believed in growing it as a subsidiary plant rather than a full-fledged crop. To take on vehicles like Qualis, Sonalika International Ltd, which till now manufactures tractors, is set to roll out its 1900 cc car ‘Rhino’ on the Indian roads by March 2005. Talking about the company’s move to enter the passenger car segment, Mr J.P Saxena, Vice-President (Exports and Marketing), said the car to be launched in the small utility vehicle category would be 10 to 15 per cent cheaper than its competitors in the segment. Taking a cue from the success of vehicles like Qualis and Scorpio, the company has invested Rs 200 crore in setting up an assembling unit in Kala Amb (Himachal Pradesh). Mr Saxena said the cars would be priced cheaper since they would like to pass on the benefit of excise and income tax exemptions offered by the HP government to their consumers. The nine-seater car would be air-conditioned and would be manufactured by International Cars and Motors Pvt Ltd. He said the company had tied-up with France-based company, Renault, for technological assistance. The group has also gone in for a tie-up with Power Train of the UK, wherein they would be manufacturing engines and gear-boxes for Rovers at its existing manufacturing facility in Hoshiarpur. Mr Saxena said the company had already ventured into three-wheeler segment in Punjab and Haryana. “Prime Minister Manmohan Singh had last month indicated his desire for a stable fuel pricing regime where petrol and diesel prices are not changed very frequently. Oil Ministry is working on that,” a top government official said. The first indication of Oil Ministry moving towards quarterly or half yearly fixing of petrol and diesel prices came when the Government decided against reducing auto fuel prices at the last scheduled revision on November 30. On that day, Petroleum Minister Mani Shankar Aiyar was keen on cutting petrol prices by Rs 0.49 a litre and diesel by Rs 0.05 per litre in step with fall in international prices, but Prime Minister’s counsel for ‘a stable pricing system’ stopped the minister in his tracks. Currently, petrol and diesel prices are fixed on 1st and 16th of every month based on the average of international fuel prices in the preceding fortnight. “Petroleum Ministry will fix benchmark grades of fuel traded in international markets based on whose quarterly average, petrol and diesel prices will be fixed. It will be a very transparent formula and anyone tracking that grade of fuel can arrive at new prices in India,” the official said. A special convention held under the banner of All-India Petroleum Workers Federation adopted a resolution demanding, among other things, an amendment to the existing Labour laws to facilitate contract labourers get protection of wages and working conditions, evolving a mechanism to ensure equal pay for equal job and service security to all labourers. A delegation of the Federation comprising trade unions affiliated to different parties, earlier also submitted a memorandum to Prime Minister Manmohan Singh in this regard, Federation vice-president Pramod Gogoi said. At Infosys, he was welcomed by Infosys Chairman and Chief Mentor Mr. N. R. Narayana Murthy, and taken around the campus. During the hour-long visit, accompanied by a business delegation and the Russian media, Mr. Putin met with the senior management of the company. Mr Nandan M. Nilekani, CEO, President & Managing Director, Infosys Technologies, provided an overview on the Indian IT industry and the company to the President. 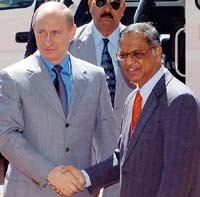 Thereafter, Mr. Putin was taken on a tour of the campus, which included a visit to Infosys’ Global Management Centre, which offers facilities for Infrastructure Management to Infosys clients. Airtel will thus become the first cellular service in the world to screen a full-length movie on mobile phones, thus adding a new dimension to the movie watching experience for the masses of today. The film will be shown on Airtel Live- the multi-access mobile entertainment portal for customers using Edge-phones with live streaming facility (using handset models like Nokia 6230) on a first-come first-view basis. A customer just needs to visit the Airtel Live portal from their Edge-enabled handset and click on the link for the movie. This one of a kind service has been made available across nine cities where Airtel Edge services have been launched, that is New Delhi, Chandigarh, Pune, Ludhiana, Bangalore, Hyderabad, Cochin, Ahmedabad, and Mumbai. (i)	If it is sold out as a whole or in parts in a phased manner. (ii)	If it is divided into a family of four, i.e. husband, wife and their two married daughters. (iii)	Can it be gifted to grandsons or daughters? (iv) If it comes within the MC limits, what shall be its status and how it can be disposed of? (v)	If any type of body, Trust etc. is formed under the relevant rules and regulations what shall be the tax liabilities on the amount received from the sale of agricultural land as a whole or in parts and what could be the options to save Capital Gain Tax. I am interested to purchase commercial properties. Is it possible? (i)	The capital gain arising on the sale of such a land would be eligible to capital gains tax whether sold in entirety or in parts. (ii)	It may be possible to divide it into four members. The division between the parties listed in your query may have to be done by gifting 1/4th share of the land to each of the other parties. (iii)	Yes, the land can be gifted to grandsons and grand daughters. (iv)	Since the agricultural land is about 1,000 ft away from the municipal limits, the status with regard to the taxability of such an agricultural land would not change even if it comes within the municipal limits. (v)	It is possible to transfer such a land to a trust provided the formalities with regard to the registration etc. are duly fulfilled. (vi)	The capital gains tax can be saved on the sale of such a land if the same is invested in bonds within six months of the transfer of the capital asset. Such bonds are issued either by National Housing Bank or Nabard or by the Rural Electrification Corporation Ltd. These bonds are issued under the capital gains saving scheme by these entities. The capital gains tax can also be saved if the amount of capital gain is invested in purchasing or constructing a residential house within the specified period. However, no exemption is available in case the capital gain is invested in the acquisition of the commercial properties. The rally has been driven by the huge inflow of FII money, which brought in nearly $ 1.5 billion in November. The total FII inflow in the country has been in the range of $ 7.2 billion during the current calendar year, which is an all-time high. Investors should take note of the fact that indices have moved in a vertical fashion during the last six weeks with a gain of nearly 12 per cent and certain amount of caution need to be exercised with respect to fresh equity investments. While we are bullish on the long-term prospects of the market but investor need to tone down their return expectations from the current levels. Bharati Shipyard (Bharati) is a private sector shipyard engaged in the design and construction of various types of sea going, coastal, harbour, inland craft and vessels. The company owns shipyards at Ratnagiri and Ghodbunder. The company has plans to acquire a shipyard in Goa and has entered into a MoU with Pinky Shipyard Pvt. Ltd. The funds mobilised from this public issue will be used for acquisition, expansion and towards additional working capital. Since the nature of the company’s business is highly volatile, investors can invest at Rs 66 in the current IPO of the company, which is slated to close this Wednesday.